The government requires hedge funds and wealthy investors with over a certain portfolio size to file a report that shows their positions at the end of every quarter. Even though it isn’t the intention, these filings level the playing field for ordinary investors. The latest round of 13F filings disclosed the funds’ positions on September 30. We at Insider Monkey have made an extensive database of more than 700 of those elite funds and prominent investors’ filings. In this article, we analyze how these elite funds and prominent investors traded Alibaba Group Holding Ltd (NYSE:BABA) based on those filings. The escalating trade war between the U.S and China has not scared hedge funds away from Alibaba Group Holding Ltd (NYSE:BABA) in the slightest, as there was another net increase in hedge fund ownership of BABA during Q3. Tiger Global has been one of the funds to Throw its Support Behind Struggling Chinese Stocks, including Alibaba, stating in its Q3 investor letter that its long-term outlook on the country hasn’t changed and noting that while Chinese stocks have lost ground in 2018, they are coming off of an impressive 2017 (Alibaba gained nearly 100% last year). Alibaba also ranked 6th among the 30 Most Popular Stocks Among Hedge Funds in Q3 of 2018, easily topping Apple Inc. (NASDAQ:AAPL) and other popular U.S stocks. Today there are numerous signals stock market investors put to use to size up stocks. A couple of the most useful signals are hedge fund and insider trading sentiment. We have shown that, historically, those who follow the best picks of the best fund managers can outclass the broader indices by a very impressive amount (see the details here). What does the smart money think about Alibaba Group Holding Ltd (NYSE:BABA)? At the end of the third quarter, a total of 127 of the hedge funds tracked by Insider Monkey were bullish on this stock, a 9% rise from one quarter earlier. 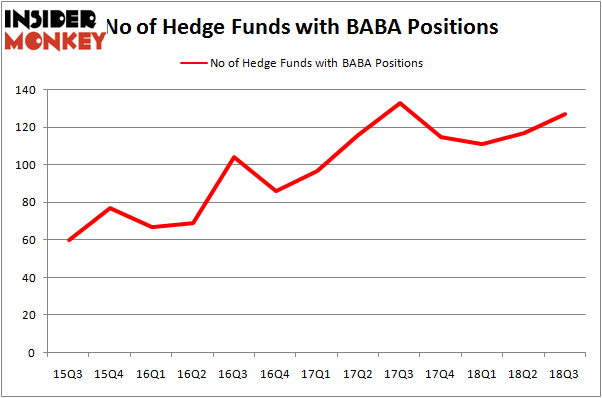 The graph below displays the number of hedge funds with bullish position in BABA over the last 13 quarters. With hedge funds’ sentiment swirling, there exists a few notable hedge fund managers who were adding to their stakes significantly (or already accumulated large positions). 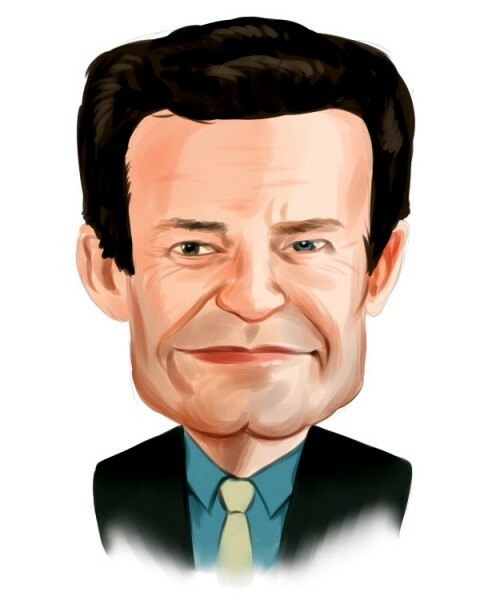 According to Insider Monkey’s hedge fund database, Fisher Asset Management, managed by Ken Fisher, holds the number one position in Alibaba Group Holding Ltd (NYSE:BABA). Fisher Asset Management has a $1.81 billion position in the stock, comprising 2.2% of its 13F portfolio. The second largest stake is held by Lone Pine Capital, managed by Stephen Mandel, which holds a $1.60 billion position; 8.2% of its 13F portfolio is allocated to the company. Other hedge funds and institutional investors that hold long positions include Andreas Halvorsen’s Viking Global and Chase Coleman’s Tiger Global Management LLC. As one would reasonably expect, specific money managers were leading the bulls’ herd. Soroban Capital Partners, managed by Eric W. Mandelblatt and Gaurav Kapadia, assembled the biggest position in Alibaba Group Holding Ltd (NYSE:BABA). Soroban Capital Partners had $276.9 million invested in the company at the end of the quarter. Daniel S. Och’s OZ Management also made a $204.8 million investment in the stock during the quarter. The other funds with brand new BABA positions are Scott Ferguson’s Sachem Head Capital, Ken Griffin’s Citadel Investment Group, and Robert Pitts’ Steadfast Capital Management. Let’s now review hedge fund activity in other stocks similar to Alibaba Group Holding Ltd (NYSE:BABA). We will take a look at JPMorgan Chase & Co. (NYSE:JPM), Johnson & Johnson (NYSE:JNJ), Exxon Mobil Corporation (NYSE:XOM), and Visa Inc (NYSE:V). This group of stocks’ market valuations resemble BABA’s market valuation. As you can see these stocks had an average of 82 hedge funds with bullish positions and the average amount invested in these stocks was $8.25 billion. That figure was $15.12 billion in BABA’s case. Visa Inc (NYSE:V) is the most popular stock in this table. On the other hand Exxon Mobil Corporation (NYSE:XOM) is the least popular one with only 53 bullish hedge fund positions. Compared to these stocks Alibaba Group Holding Ltd (NYSE:BABA) is more popular among hedge funds. Considering that hedge funds are fond of this stock in relation to its market cap peers, it may be a good idea to analyze it in detail and potentially include it in your portfolio.